Also known as Kidny Vetch or Jupiters Beard, anthyllis is a low growing hardy shrubby plant with downy grey leaves and dense heads of purple pink blooms in summer. A member of the pea family Leguminosae, it is native to the Swiss Alps. 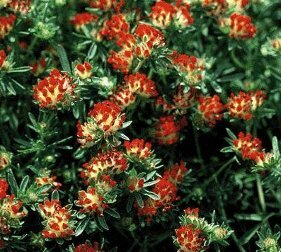 An excellent walk on plant, it also is used as a groundcover and for low borders. It prefers a rocky, rather limey soil. Plants can be propagated by digging and dividing existing plants in the spring, by taking soft wood cuttings, or by sowing seed. Seed germination can be sped up by soaking the seeds for 8 hours before sowing or by nicking the seed with a knife, or both; (SEED SCARIFICATION). Medicinally, Anthyllis is used as a laxative and to treat skin eruptions.